This post is part of a series to help promote Zazzle products. If you like what you read, consider purchasing our book, Make Money Online Using Zazzle. We’ve discussed how you could open a Zazzle business and how you can boost your take home income as a Zazzle affiliate referring other people’s products. It takes a lot of time to refer products one-by-one. You can use an RSS Feed to automatically capture Zazzle products and post them to blogs, emails, and social media platforms. 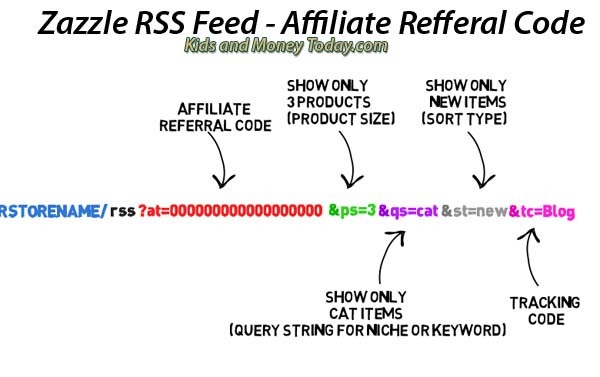 RSS stands for Rich Site Summary (also referred to as Really Simple Syndication). In simple terms, this is a line of coding that pulls information from a designated source. In our case, it will pull from Zazzle. Your referral feed can include information like: full or summarized text and metadata such as publishing dates, title, descriptions, and authorship. Use a feed to group products by theme or niche. In this tutorial guide we will help you create a Zazzle RSS feed coding. In later articles, we will show you how you can use this coding to for online marketing for your blog or on social media networks. You can also include a tracking code. The tracking code lets you know exactly where the user originally clicked to enter Zazzle. You might use one code for Facebook, another for Twitter, Tumblr, and so on. Follow these steps to build a URL to pull a unique list of products from Zazzle. In both cases: change YOURSTORENAME to the name of your store and replace all the zeros after the at= with your own associate referral code. *When you are signed into Zazzle, your affiliate referral code is at URL: http://www.zazzle.com/my/associate/associate or you can also try clicking here. When you are using a RSS feed, the feed will generally present a group of products. There will be times where you only want to show a distinct number of products (such as posting to social media – you don’t want to send 96 affiliate products at once). To limit the number of products displayed, we must add an additional parameter to the coding. The parameter is ps which refers to Page Size or number of products per page. We will add it to our previous coding with a number. The number will represent the number of products we want to appear in the feed. 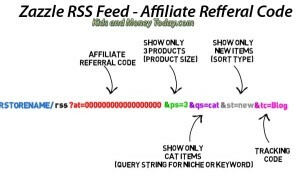 Associate RSS Feed – How to Use the ? and & in Coding? The most Frequently Asked Question (FAQ) when beginners create a Zazzle feed is, “Do I use & or ? before my referral code? ANSWER: It depends on the location of your referral code. The important thing is the ? always comes prior to the first parameter. Use the query string parameter qs to stream Zazzle products with a common theme or niche. It can be something like a product line (giftbox) or a keyword such as cat (used in our example below). If we remove your store name, we can pull 3 items from the entire ZAZZLE marketplace containing the tag ‘cat.’ This is a format affiliates with no shop on Zazzle would use to promote. Use the parameter st for Sort Type to pull your items sold (popularity) or new items (date_created). You can use the tracking code parameter tc to track where people are clicking your Zazzle links. Where do I analyze my tracking results? This post is focused on setting up proper Zazzle RSS Feeds. Analytics needs it’s own post. A short and quick answer: When you view your affiliate earnings page, you will see the tc code beneath the product description. A longer and better answer is to begin using a program like Google Analytics to monitor your customer user actions. How are you using Zazzle RSS feeds for your store? Tell us in the comments. This is one of our recent videos showing how to use a Zazzle RSS Feed inside Mass Planner 2 software. Still pondering about starting a Zazzle business? Zazzle is expanding offices – click here. Why do businesses open branches in Ireland? See here. We’ve updated the video and article post to show coding for the Zazzle RSS feed using the ?at as that seems to pull better with most platforms. The ?rf is used in other type of feeds such as Google Base. See the RSS guide for more information. This doesn’t attach the affiliate referral code. No way of doing it works as far as I know, even Zazzles official feed, http://www.zazzle.com/sell/affiliates/promotionaltools/rss, plus the affiliate code. Hi Matt. It does attach the referral. The referral part is: ?rf=000000000000000000 and you change the zeros to your associate ID. At the bottom of the link you sent is another link to the RSS guide pdf file with more information on coding links using the Zazzle RSS or Google base coding. I hope that helps a little. Tracy, I fully understand how the referral codes work, however if you take any of your examples using a known store name (I used marvelextreme) and put them into a rss reader, I used feedly, the referral is removed from this link. This also happens with a rss syndicator on a wordpress site. How are you using the feeds and still maintaining the referral? Do you have a working example? Thanks for sharing more on the issue you found. I’m sure every platform will need to be tested for success/failure. I don’t use Feedly but I took a look and it appears the Google Base feed does not hold the referral ID in Feedly, just as you’ve stated. The Google Base feed does hold the referral on some other platforms (IFTTT etc.) so you can use it for some social media. As a side note, is marvelextreme your store? I think Zazzle blocks the feed from certain stores. Amazing! It works! I can’t believe the only difference is “at=” as opposed to “rf=” and its working perfectly. Thank you so much. Marvelextreme is the example rss feed store on the Zazzle info page, thats why I used that as an example. Glad to hear it worked Matt. I’m sure other readers using Feedly will find it helpful. Thanks for bringing up the issue. If you want your tracking code held in place, try Zaps. That’s what I use for almost everything now. Terms: Monday April 21st starting 00:01am and finishing 11:59pm on Tuesday, a 48-hour code!